Willow had his dew claws removed today - not all dogs get them removed, but our vet suggested that since Willow will be an active, playful, outdoor dog, that we should go ahead and have them removed just to be safe. If you're not familiar with a dog's dew claws, they are the little thumb claws - some dogs have them their whole life and others have them removed when they are puppies. If a dog has them, they can get caught on things like roots, fences, etc. and may rip, tear or break. This is super painful for the dog and can require surgery and may be prone to infection. So with the recommendation by our vet, we decided it was best to go ahead and have them removed while they were still developing and not have to worry about it. It was fairly inexpensive. We take Willow to Patrick Veterinary downtown on Meeting St. They are awesome - they answer all of my endless questions and you can tell they genuinely care about your dog. 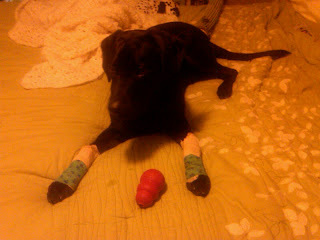 Poor Willow now has two casts on his front legs and he hates them. He starts to lick or bite them and I quickly say "No, no Willow" and he looks at me with these sad little puppy eyes. My heart breaks for him...but I know it's a small amount of discomfort for a week so we don't have to worry the rest of his life. It's almost like having a sick child - when we got home he went straight to my bed to lay down...but he hadn't eaten since last night, so I had to bring him food and some treats. He's passed out now next to me...he's so pitiful, poor little thing. Any tips or suggestions on how to keep him from licking or biting his bandages short of getting him a giant cone to wear on his neck? Oh my goodness, that picture is so pathetic! I know that they sell sprays (bitter apple/lemon/etc) to keep dogs off furniture, that might keep him from licking the bandages, BUT I would worry that the spray might seep through and bother the wounds. The vet would probably be able to give you some ideas, but a cone is all I can think of. Aww...he looks so pathetic. I totally agree - having a sick puppy is like having a sick child. I worry so much when my Riley is not feeling well or has to go to the vet. awww poor thing. I hope he heals quickly! aww he is adorable! I hope the healing goes well. He will definitely thank you later! Aww he looks so cute! Cameron's family is friends with the Patrick's! Poor guy w his little casts!